New Jersey activists have been working tirelessly towards raising the minimum wage. Groups such as Businesses for a Fair Minimum Wage, the Poor People’s Campaign, and Fight for $15 rally and organize to secure a more significant economic floor for lower wage workers. For those of us working towards a more transformational vision of society, a higher minimum wage is a necessary first step towards recognizing a future built upon the maximization of agency and access of every individual. There are some dogmatic believers in our current form of market economy here in the United States. Believers of Austrian Economic Theory  would argue that raising the minimum wage is fundamentally against the best interest of a market-driven economy. Austrian Economics explains that the market should be utterly free of regulation and influence of the government (sound familiar? ), and therefore any minimum wage regulation would be an incorrect decision as market economies should be the sole determiner of the wages paid for labor. We can observe the data that demonstrates this theory leads to lower wages for workers who are producing more. Austrian Economic theory provides no solution for crises and eliminates the human element, imagining markets as some natural law instead of a malleable human construct. The approach also subscribes to allowing the market to fix any/all problems that were generated by the market. We could imagine the scenario if all of the major financial institutions were allowed to collapse back in 2008 and what the impact would have been on our established systems of exchange as well as the quality of life on the average American who would suffer the most. Finally, market fundamentalists lack the data to support their vision which is why we don’t see any society implementing a purely market-driven model within their institutions. The argument against a more vital suite of protections for the individual, including a system of more equitable labor, is an argument for personal interests at the expense of others. Specifically, arguing against a minimum wage increase from the lens of a market purist is an ideological argument that is not rooted in evidence. As with any argument for social transformation our biggest asset is the data supporting our efforts for change. The typical case against a minimum wage increase is that it harms small businesses and will reduce overall economic activity (people will get fired and therefore spend less). This was the big question in my mind when I first started exploring the topic, but I was happy to find that with a small amount of time spent researching my initial assumptions were incorrect. 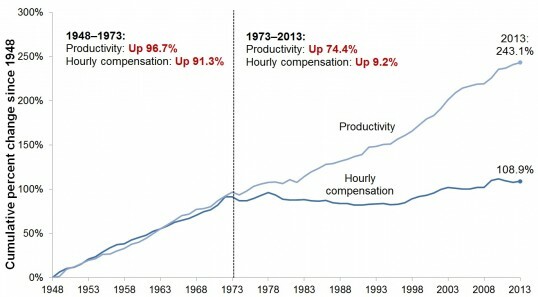 There have been a significant amount of studies conducted utilizing the historical data available that have determined, quite clearly, that an increased minimum wage creates an overall net benefit for total economic activity. Paul Sonn and Yannet Lathrop provided a data brief for the National Employment Law Project stating, “…These basic economic indicators show no correlation between federal minimum-wage increases and lower employment levels, even in the industries that are most impacted by higher minimum wages. 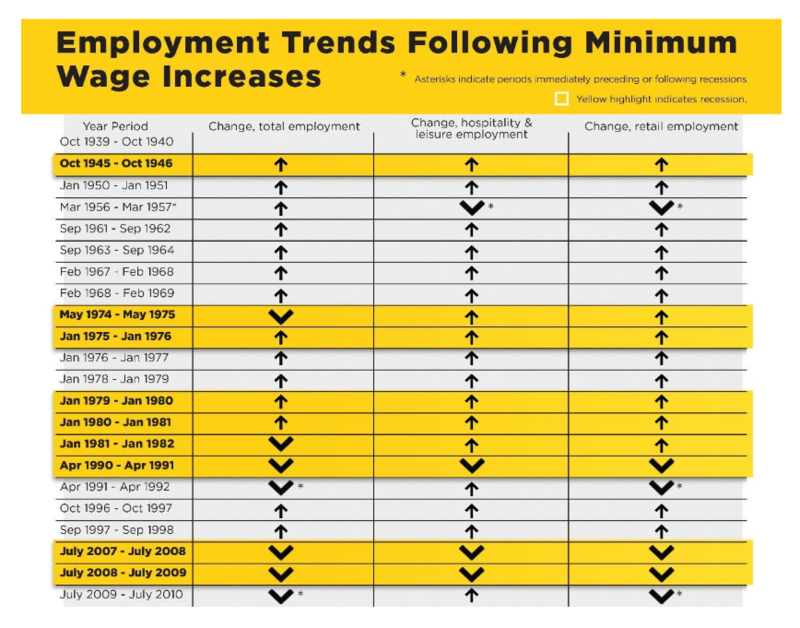 To the contrary, in the substantial majority of instances (68 percent) overall employment increased after a federal minimum-wage increase” Below is a visual demonstration of what happened in each instance of a minimum wage increase. This information should be at the core of every argument for a minimum wage increase, the data is clear – it generates significant net benefits. Of course, in a competitive capitalist system, there will be losers. Some businesses will fail, and that is OK. The goal of creating Progressive alternatives is not to create equality of outcomes, that is a fallacy that can never be realized under a set of social institutions that encourage innovation and experimentation. Another argument I’ve observed against an increase in minimum wage is that such an increase would create inflation, effectively nullifying the increase. This is a flawed argument as it assumes that all producers within the specific vertical being reviewed are employing wage labor below the $15/hour threshold. Brandon McKoy of the NJ Policy Perspective produced a detailed study outlining just how far off the mark this assumption is. Speaking with the perspective of an entrepreneur, founding a business is a challenging endeavor that requires constant change and adaptation. All plans for phasing in a new minimum wage are gradual and would give existing businesses plenty of time to adjust accordingly. Future companies would have to consider the new wages in their initial planning but could gain solace in the increase of disposable income among a section of the population that would be freed for consumption. As argued in previous articles about the Progressive Brand and Core Objectives of Progressive Transformation, Progressive thinkers, activists, and political leaders need to coalesce around a uniting vision forward. That vision should focus on increasing access and agency for every individual to transform the world, and in doing so, transform themselves. Increasing the minimum wage is an important incremental step in building a more equitable and innovative society. Individuals who benefit from the receiving of these monies will have more access to tools necessary for increasing their agency to change themselves and the world around them. Raising the level of economic and personal security is a cornerstone of modern Progressive projects as it enhances every individual’s ability to experiment and innovate in all walks of life. When we raise the collective floor, all of us gain the ability to reach higher and in different directions than previously imagined. For the Progressive project, minimum wage increases should be viewed as stepping stones towards building a society based on free labor. Free labor was the ideal of many pivotal figures throughout history such as Abraham Lincoln  and Karl Marx . All but abandoned by modern Democrats, Republicans, and even many Progressives, an economic model supporting free labor is the ultimate ideal for maximizing agency and access within a society. Free labor is a system where the individual has access to the necessary education, information, and resources to experiment and innovate in whatever field that would like to pursue. Free labor as described cannot exist without numerous other systemic reformation initiatives, however once realized the collective human population would experience innovation and prosperity at levels that at present would seem fantastical. The Progressive project should focus on providing people agency in the process of transforming their lives and the world around them. Free labor is the transformative vision that for the Progressive project and raising the minimum wage is the next logical step.